Open data portals are the bridge of the data publishers and data consumers, so they are important components in the open data topology. The most well-known and earliest open data portals are deployed by different levels of government. But with the evolution of the open data ecosystem, the data providers become more diverse and the data assets are no longer limited to government related data. According to the regional analysis on Europe in Open Data Barometer 2013, 4 countries in Europe are listed in the top 5 countries that uptake Open Government Data, and they areUnited Kingdom, Sweden, Denmark and Norway. 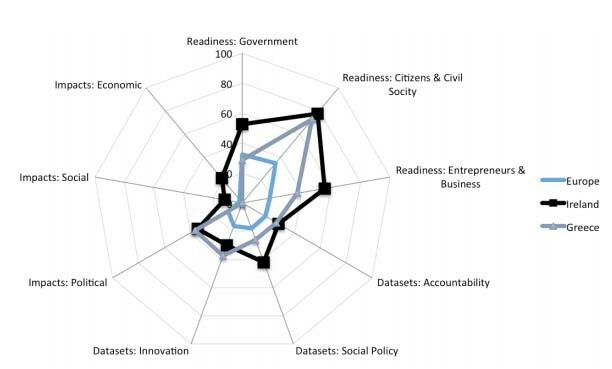 The figure below shows the average of Europe, Ireland and Greece in each aspects of the metrics used in Open Data Barometer. Currently, there is still no standard rule to categorise the Open Data portals and it is not the main objective of this project to develop such rules in this project. So, in this section we simply categorise the portals in EU by their maintainers and identify the specific domain of the data assets. For this deliverable, we are not trying to list all the open data portals in EU, especially for local government open data portals and the data assets published by NGOs and companies, but rather to offer background knowledge for other deliverables in WP2 on what data sets are available and what should be monitored. 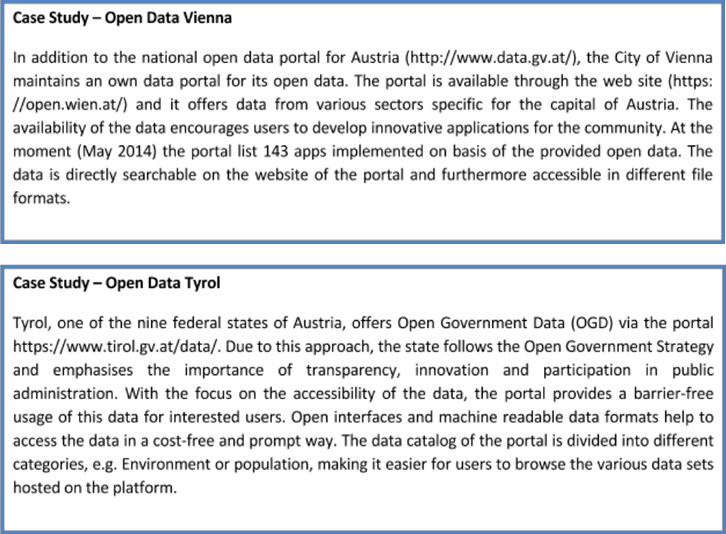 On a European level, there are a few portals officially published as the central hub of EU open data. Examples include the European Union Open Data Portal, Europe Public Data Portal and EuroStat. Europe Public Data Portal is developed by the LOD2 project based on CKAN platform and currently hosts nearly 50,000 data sets harvested from different data catalogues across EU. The European Union Open Data Portal mainly hosts data sets that related to public sectors on EU level. This portal publishes its data set via Linked Data approach and all the data sets’ metadata can be accessed via SPARQL endpoints. Compared with the former two instances, EuroStat can be dated back to 1953 and its current key role is to supply high quality statistics to the EU Commission and other organisations in Europe. According to the European Union Open Data Portal, 17 members of EU have already developed their own national-level Open Data portals, while many more countries are showing keen interests in setting up their own portals. Data.gov.uk is the very first Open Government Data portal in EU and now it has been expanded to nearly 20,000 different data sets covering various public sectors in UK. Even though the regime and data catalogs are different from one another, major EU countries have published their data via national level data catalogues, including Germany, France, Netherland, Spain, etc. Those portals are usually based on CKAN, but the functionalities of the portal are customised according to the requirements of each country. Local level portals can host data ranging from region/province, city, district or even smaller area. Compared with national level open data portals, local level portals offer more data on local environment with smaller granularity. Linz open data portal in Austria, Hampshire open data portal in UK, Toscana open data portal in Italy are examples of portals on region level. On city level, major cities in EU, such as London, Copenhagen, Paris, Graz, Rotterdam, etc., have also set up their open data portals. CKAN is also the most popular platform for local level portals. However, considering the technology readiness of different regions and the cost of deployment, many local level portals also choose cloud-based commercial platforms such as Socrata or Junar to host their data. Except for the portals that host data sets in comprehensive domains, there are also portals that focus on data sets in one or more specific domains. For example, the Greece Open Government GeoSpatial Data portal mainly publishes and visualises data with geographical/spatial elements, such as maps, road networks, shoreline and beach boundaries. Transportation for London Open Data hosts real- time traffic data sets (Tube stations, bus stops, real-time bus positions, etc) and they are streamed via Web API. Police forces in England, Wales and Northern Ireland also publish their Crime and Policing data for users to analyse and build applications. Usually, the domain specific data portals have higher quality data sets in those specific domains compared with comprehensive data portals, their data sets are more structured, which can lead to increased reuse of the data. For example, the Greece geospatial data, data.police.uk crime data and UK land registration data are all published as machine-readable Linked Data. Private sectors or businesses are an emerging part in the open data ecosystem, still with a limited interest in comparison with the popularity of the OGD. However, open data in private sectors can lead to new business models and add significant value to businesses. There are some studies about the value of open data in private sectors, such as the Deloitte report (Deloitte, 2012) and McKinsey report (Manyika, 2013) as mentioned previously in Section 2.1. There is an ongoing project named Open Data 500, which studies how OGD can generate new business models and products in U.S. Currently, more than 200 companies across U.S. have submitted their surveys and explained how the open data can help improve their businesses. Different from the open data in public sectors, the data publishing platforms in private sectors are highly tailored for the business models and requirements. So each business will usually develop their own platform and API for those purposes.